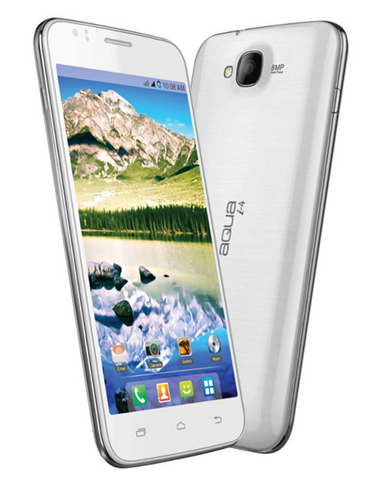 Intex yesterday officially launched Intex Aqua i4 one of its Budget Android devices priced at 9,490 INR. This phone comes with moderate specifications and is the younger brother of last Intex flagship device Intex Aqua i5. Let’s take a scrutinizing look at the specification to determine whether this phone has what it takes to stand the competition in the overcrowded budget android market. This phone sports an 8.1 MP (3264×2448 pixels) primary camera at the back with LED flash. A front camera of 1.3 MP is also present for those interested in Video calling. A phones camera is much more than the Mega Pixel count and the images depend more exclusively on quality of lens and imaging hardware. As far as MP count goes this phone goes above average considering the price range. The internal storage is extendable to 32 GB. The exact amount of internal storage and that available at the users end has not yet been specified by Intex. The RAM capacity has also not been specified yet. This phone is powered by 1.2 Dual core processors whose make has not been specified. A dual core processor at this price range is disappointing. Many phones like XOLO Q700, XOLO Q800 and Panasonic T11 are offering Quad core processor at this price range. This processor will suffice for general purpose usage. The battery capacity is 2000 mAh which is again above average. Considering the dual core processor in this device, the battery capacity is expected to carry you through a work day without much trouble. This phone comes with 5 Inch 854 x 480 pixel FWVGA display similar to phones like Micromax Canvas Fun A76.The display will appeal to those looking for a bigger display at affordable price. This will give you around 196 Pixels per inches which is not very clear and you might see some resolved pixels. The display will suffice for general purpose usage. On the software end this phone operates on Android 4.2 jelly bean operating system which will provide you with respectable Android experience. The phone will come with various preloaded apps like Intex play, Intex Zone, Hungama, Facebook, etc. Intex Aqua i4 looks quite premium as far as the build quality is concerned. The edges have a metallic touch and the back panel has metallic texture. The camera sensor is covered by a rectangular glass rounded at the edges and the power key is present on the left side. The Connectivity features include 3G, WiFi,GPRS, EDGE,USB, Bluetooth and GPS with AGPS support. This phone will compete against lesser priced phones with similar specifications like Micromax Canvas Fun A76, Spice Stellar Virtuoso pro + and Celkon Signature One A107+. The competition that is expected to carve a major dent in its sales will expectedly come from Budget quad core devices like XOLO Q700, XOLO Q800 and Panasonic T11. This phone brings nothing new to the table and appears overpriced. Similar specification is being offered by other domestic manufacturers at lower price range. The budget quad core phones with slightly smaller display will appeal more to most users. This phone might make more sense to those looking for a larger 5 Inch display but for that too cheaper options like Micromax Canvas Fun A76 are available.